Sense Home Energy Monitor: Track electricity use and costs. Real-time remote power monitoring. Create custom alerts. The Sense monitor is a small but powerful computer installed in your home's electrical panel by a licensed electrician. It analyzes changes in current and voltage over one million times per second to measure power consumption across your entire home. Over time, Sense's machine learning algorithms identify unique signatures in the power use of individual devices within your home and match them against a growing database of appliances and home electronics. Once devices are detected, you can see when they turn on or off, how efficient they are, and what's going on at home when you can't be there. These detection capabilities continue to grow as more users install Sense in their homes and more device models become available. All this information is made available through our free iOS and Android apps, so you can get energy insights, home awareness, and peace-of-mind in real time from anywhere in the world. Built by the same team that brought speech recognition technology to market, our founding team pioneered the commercialization and widespread adoption of speech-recognition technology. Sense can be a great solution for monitoring the security of your rental property or vacation home, and checking in on elderly loved ones. As long as Wi-Fi available, Sense can help you unobtrusively keep an eye on things from afar. Sense is rigorously safety tested and approved for use in 120 volt US homes by the Underwriters Laboratory (UL) and Intertek (ETL). • Sense works with split-phase 120v residential electrical panels. Sense doesn't currently support three-phase or parallel feed installations. Electrical panels with busbars must have enough clearance for sensor clamps with dimensions of 3 6/16"H x 2"W x 12/16"D, and an inside diameter of 1". ENERGY MONITORING: Real time remote monitoring of your energy use and home activity through our iOS, Android, and web apps. SEE WHAT'S ON AND WHEN: See how much electricity you use, when your kids got home, whether your sump pump is on, and more. Integrates with Alexa and IFTTT. EASY INSTALLATION: Installs in your home's electrical panel with the help of a licensed electrician. Connects to your home's Wi-Fi for secure access from anywhere in the world. Most installations take less than 30 minutes. 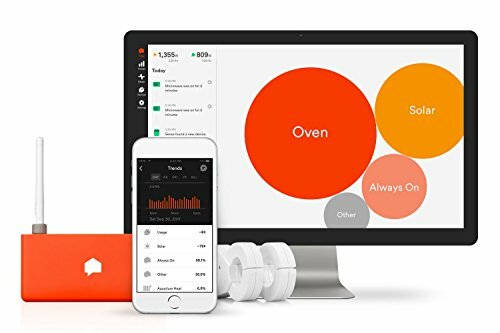 REDUCE YOUR UTILITY BILL: Measure power consumption in dollars and cents to see exactly how much particular devices are costing you. ETL LISTED: Rigorously tested for safety and certified compliant with UL and IEC standards. Designed specifically for traditional split-phase, 120 volt homes in the US. If you have any questions about this product by Sense, contact us by completing and submitting the form below. If you are looking for a specif part number, please include it with your message.